Inspired by the success of East Asian economies, the demographic dividend framework is taking off in sub-Saharan Africa, where many are yearning for workable solutions to the region’s ongoing development challenges. In Addis Ababa this week during a workshop hosted by the National Planning Commission and the United Nations Population Fund, leaders will grapple with how to accomplish the economic boost of a demographic dividend in Ethiopia. As a climate change hotspot facing one of its worst droughts in decades, the linkages between Ethiopia’s population and its development are more important than ever. A demographic dividend refers to accelerated economic growth that can begin when a country shifts from high to low birth and death rates. As mortality and fertility decline, a country’s working-age population grows in relation to the number of young dependents, opening a window of opportunity for faster economic growth. Over the last two decades, Ethiopia has experienced an impressive decline in fertility, enjoyed strong economic growth, and made great strides in poverty reduction. According to a new report, these achievements indicate that Ethiopia may be on track to reap a demographic dividend, but policymakers must act to both take advantage of opportunities and address remaining challenges. The payoff could be big: Recent DemDiv modelling results show that if Ethiopia makes the investments needed to realize a demographic dividend, the Gross Domestic Product per capita could jump more than 20-fold, from $498 in 2010 to $10,189 by 2050. Between 2000 and 2014, Ethiopia’s total fertility rate – the average number of children a woman has over her lifetime – dropped from 5.9 children per woman to 4.1. This fertility decline is a result of several changes. Health services have expanded, increasing access to modern family planning to rural areas. Married women using a modern method of contraception increased from 6 percent in 2000 to 40 percent in 2014. Infant and child mortality have declined, as well as rates of child marriage. As a result of changes in mortality and fertility, the age structure of Ethiopia’s population has begun to shift from a high proportion of young people to a relatively higher share of working-age people. The population pyramids below show this change to age structure between 1990 and 2010. Based on this progress, and if Ethiopia’s fertility decline continues, the age structure will shift even further by 2030. Fertility can be lowered further through rights-based approaches if Ethiopia makes it a priority to expand the available contraceptive choices and to improve the quality of health services. Stronger health systems governance is also needed, including monitoring and evaluation of family planning programs. The demographic dividend isn’t just about fertility and family planning; access to education and employment are also crucial. The knowledge, skills, and capabilities of Ethiopia’s future working-age population will determine the extent to which Ethiopia can capitalize on demographic changes. Simply put, for a demographic dividend in the future, we must invest in young people today. Education can open up opportunities for young people and contribute to the future development of Ethiopia. Girls’ education – especially at the secondary level – often supports a fertility decline and improves economic growth because it prepares women for non-traditional roles outside the home. More educated people also have better chances of obtaining loans and financial assistance for small businesses. In Ethiopia, the proportion of children who had never been to school dropped from 67 percent in 2000 to 28 percent in 2011. And more girls and women are being educated. Literacy rates of women ages 15 to 49 doubled between 2000 and 2014 from 19 to 41 percent. Despite progress, there is still much room for improvement. Attention should be paid to both educational attainment levels and the quality of education. Too many Ethiopian young people, particularly girls, still receive no education, not enough education, or low-quality education. To harness the benefits of a demographic dividend, the Ethiopian economy must also be able to absorb the large number of people who will become working age over the next several decades. 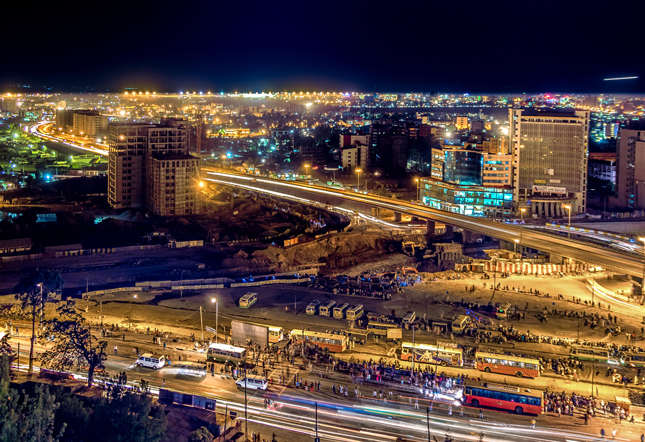 Ethiopia has been one of the fastest growing economies in Africa for the past 10 years, according to figures from the African Development Bank. But, despite high growth rates, unemployment continues to be a challenge, particularly in urban areas, where rates are almost 17 percent and more than twice as high for urban women compared to urban men. Youth unemployment is of particular concern given the importance of getting young people on the right track early. To foster strong job growth, the Ethiopian economy should be driven by the strength of an educated population, connected to the global marketplace, and characterized by diversity, flexibility, and the ability to withstand shocks. Decision-makers and experts meeting in Addis Ababa this week should take heart. Ethiopia’s recent progress in health, education, and economic productivity shows that a demographic dividend is possible if fertility decline continues and leaders can create a conducive policy environment through good governance. Strategic investments in health and education will continue to develop the country’s human capital. Ensuring that economic opportunities are available for the growing working-age population is the determining factor in whether Ethiopia will be able to fully benefit from its efforts. Policies that provide incentives to invest, save, and encourage trade, as well as a flexible strategy for producing a well-trained work force, will yield a stronger economy with greater employment and earning opportunities. The demographic dividend provides a one-in-a-lifetime opportunity for Ethiopia’s transformation. Assefa Admassie is a principal researcher at the Ethiopian Economics Association. Shelley Megquier is a policy analyst at the Population Reference Bureau. Sources: Africa Renewal, African Development Bank Group, BBC, Central Statistical Agency (Ethiopia), Health Policy Project, OCED Development Center, Population Reference Bureau, UN Development Program. 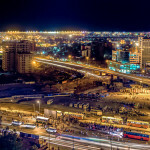 Photo Credit: Addis Ababa at night, used with permission courtesy of the Population Reference Bureau/Zoonar GmbH/Alamy. Graphics: Population Reference Bureau.